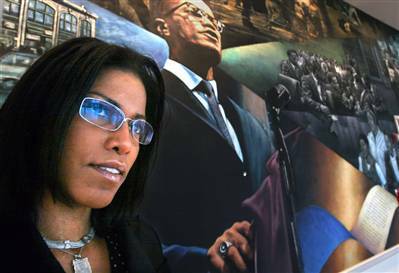 Ilyasah Shabazz stands by a mural featuring her father, Malcolm X, last week inside New York City's Audubon Ballroom, the scene of his assassination on Feb. 21, 1965. Q: It's perhaps a little unfair to ask what you remember of your father, but what do you remember of him as a family man? So much is made of him as a fire-breathing public figure. What personal dimensions of the man can you share? Shabazz: Of course I was in love with my father as a child. He was daddy and our house came alive in a special way whenever he walked through the door. He’d romp and play with us; my sisters and I would literally squeal with excitement when daddy came home. In the evenings I’d wait for him at the front door. He'd come in, pick me up, throw me over his shoulder, get a plate of oatmeal cookies that my mother made from scratch, and we’d go into the den to watch the news and share the delicious cookies. Q: What would he have made of the hip-hop lifestyle? Shabazz: Well, I think my father would avoid the pitfall of monolithic generalities and simplistic assessments of complex movements or genres. Remember, my father was a complex man and some people wanted to reduce him to, as you suggested earlier, a “fire-breathing public figure” who, as such, had no real credibility. I don’t know that there is a, quote, "hip-hop lifestyle." I think the music responds to complex social issues and injustices; I think it also raises complex social questions. To the extent that young people are conscious and aware of human rights issues and the problems of miseducation, I think my father would be pleased. To the extent that history and thinking and self-pride are conveyed, he would applaud the artistic efforts. I'm certain he would encourage everyone to live lives of service to God and commitment to family and community, and to learn historical facts. Q: The 40th anniversary observance of his passing comes in an America newly, and in some ways angrily, sensitive to Islam, related to the events of 9/11 and a variety of conflicts around the world. How do you think your father would have responded to the American reaction to Islam today? Shabazz: Again, I think we must be careful of monolithic generalities. I don’t know that there is a quote, "American reaction" to Islam today. There is no “one American” or “one American reaction” to anything. To the extent that there is any reaction that would condemn Islam and Muslims on the basis of the tragedy of 9/11 and the travesties of wars and conflicts in the world ... well, I think my father would respond to such fallacious thinking and faulty premises the way he always did — expose them for what they are and challenge all of us to think more clearly and let our actions always be based in truth. I think he would point out the absurdity of condemning an entire religion and applauding the trampling of the human rights of its followers ... in response to the zeal of a limited number of practitioners. It just doesn’t make sense — no more sense than to condemn all Christians and arbitrarily round up Baptists and detain them indefinitely because a few fundamentalists bomb abortion clinics and kill doctors who provide these kinds of services to women, or to lock up all priests and condemn Catholicism because a number of clerics broke the laws of the faith and of man. And how would he respond to the way in which the tenets of his faith are being violently corrupted by extremists? I’m certain my father would welcome any debate about the tenets and practice of Islam. Throughout his life, he would have continued to study the faith of his choice — seeking to expand his understanding of Islam in its various dimensions. He would be a strong voice of advocacy for Muslim self-determination and freedom from oppression. By the same token, he would distinguish between legitimate liberation struggles and acts of terrorism, because Islam itself makes that distinction. 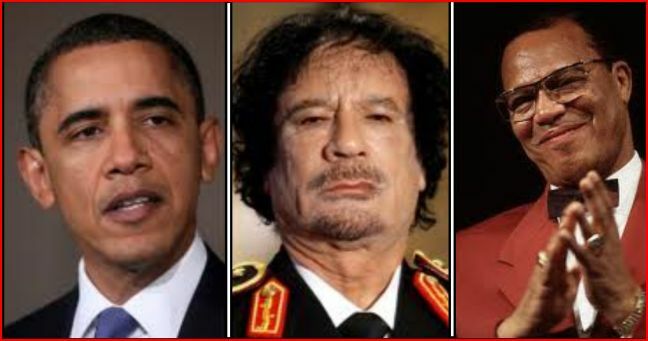 FARRAKHAN: "I warn my brother don't you let these wicked demons move you in a direction that will absolutely ruin your future with your people in Africa and throughout the world...Why don't you organize a group of respected Americans and ask for a meeting with Qaddafi, you can't order him to step down and get out, who the hell do you think you are?